“Guess what?” one of my colleagues announced. “The district was offered the opportunity to host a Newbery Medal winning author for a live webcast.” My ears perked up. “Who is it?” another colleague asked. I literally almost fell out of my chair. A small squeal escaped my lips, and I quickly clasped my hand over my mouth. I couldn’t believe it. My idol. Kate DiCamillo is everything to me as a reader and a writer. Her books are beautiful and quiet and honest. The Miraculous Journey of Edward Tulane and The Tale of Despereaux are two of my most favorite stories. Honestly, I can’t think of a writer I admire more than Kate DiCamillo. Show up and do the work. It’s what I need to do. If you fancy yourself a writer, it’s what you need to do as well. As teachers of writing workshop, we have our hands full. We plan minilessons and choose mentor texts and keep conference notes and give feedback. DiCamillo reminded us of what really matters amidst the hustle of writing workshop: Every day, students must show up and do the work. The magic is in simply doing the work. Here are a few more of my favorite notes from the conversation with Kate DiCamillo and John Schumacher. DiCamillo never reads her books after they are published. It is impossible for any piece of writing to be perfect, and she knows she has to let her writing go when it is imperfect. You have to read to be a writer. Sure, you can get ideas from other books, but mostly you will learn how to tell a story. DiCamillo never really abandons her writing. She doesn’t let it go entirely. All of a sudden, she might understand how to tell that particular story. She doesn’t abandon writing out of laziness or fear. Those aren’t good reasons. She would be lost without a notebook. She is always, always paying attention. She says to keep a notebook and keep every part of yourself open. Your eyes, ears, and heart. The heart is the hardest. Something that surprises her when she is writing was how the books change her as a person. They give her the gift of opening up a little more. DiCamillo writes a rough draft then puts it aside and starts all over. The first draft becomes a road map. 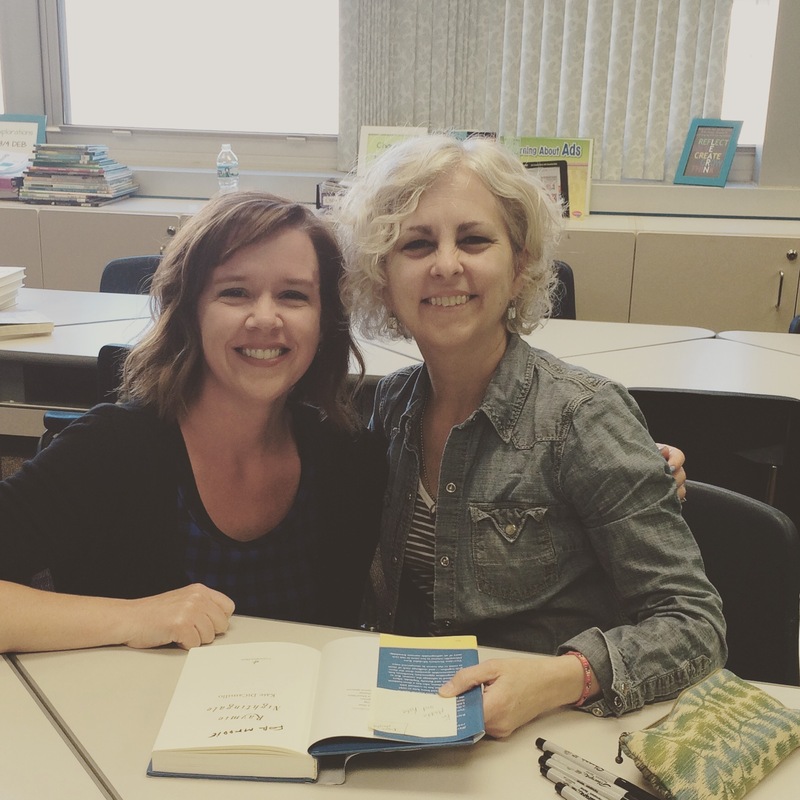 Dana–thanks for writing about your time with Kate DiCamillo. What a thrill! As I head into teaching fourth grade (from first), I’m so excited about sharing her work with students. This is revelatory! Thank you for these notes, this insight about Kate DiCamillo’s writing. I really loved this “Something that surprises her when she is writing was how the books change her as a person. They give her the gift of opening up a little more.” How beautiful!! I love the picture! Your smile is infectious. Thank you for sharing these bits of writerly wisdom from Kate. I can’t wait to share them with students. The gift of meeting your idol! Your excitement is evident and almost giddy! I love the point Kate Dicamillo makes about never actually giving up on writing. This is a great message to all of us who show up to do the work. I’m encouraged because even though “showing up” is hard, it’s something I can do. Kinda envious, I am of you. Indeed the heart is the hardest. Hopefully you come away from such experiences with a renewed sense of purpose. It is so easy to feel you come up short when reviewing your own practices. I can feel the excitement in your post and I can only imagine the thrill of meeting Kate DiCamillo. My favorite piece of advice is to keep a notebook and keep every part of yourself open. Your eyes, ears, and heart. Your heart is the hardest. It reminds me of a saying I use, “It never gets easier you just get better.” Happy writing! 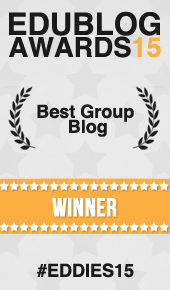 Such a timely post as the Writing Institute gets under way . . . Two pages per day!!! Time to write, write, write!